Today is a special cookie day! My recipe is being featured on Dish Towel Diaries along with a giveaway of my book! Check it out and enter to win here . As for that recipe, it had to be gluten-free (for that site) and dairy-free (for me). This was a recipe I made a few months ago for a cookie exchange with friends Lori and Katie. I am pretty new to grain-free baking, so I opted to play it safe with my first coconut flour cookies by using this tested recipe from Jamie Oliver with just a few alterations to meet with my diet needs. I am still working on the egg-free / vegan version; thus far the results haven’t been postable. As is, this is a slightly cakey cookie (but with a rather addictive texture) that is just sweet enough – a nice step back from the sugar-rich holiday season. I also decided to use some coconut sugar to add depth to the flavor. If you prefer a refined sugar-free cookie, I think you could use coconut sugar or evaporated cane juice (Sucanat) for all of the sweetener. On the contrary, if you want to go simple and more traditionally “Snickerdoodle,” just use all white granulated sugar and skip the brown. This recipe is Dairy-Free, Gluten-Free, Nut-Free, Soy-Free, Wheat-Free, and optionally Refined Sugar-Free. Recipe slightly adapted from JamieOliver.com. In a mixing bowl, beat the 1/2 cup of white sugar, coconut or brown sugar, eggs, vanilla, and coconut oil together (make sure those eggs aren’t cold, otherwise the coconut oil may solidify and leave little chunks). In a small bowl, stir the coconut flour and salt together, and then stir them into your wet mixture. Let it sit for 5 minutes. If the dough appears too soft or wet to handle, place it in the refrigerator for 30 minutes. It will set up quite a bit as the coconut oil chills and solidifies. Combine the two topping ingredients in a small bowl. Scoop the dough and roll it into balls. Jamie suggests using a small melon ball scooper, but I did them by hand and they were just a little smaller than a golf ball. Roll the balls in the cinnamon-sugar mixture, place the cookies on a baking sheet (preferably lined with parchment paper or a silicone baking mat – I use a baking mat), and flatten them a bit. They don’t spread much. Bake the cookies for 15 minutes. They will darken slightly. Let the cookies sit on the baking sheet for a few minutes, before removing them to a wire rack to cool completely. OMG, I’m in love with this recipe just from reading the ingredients! Seriously. Our whole family loves Snickerdoodles and I haven’t been too keen on the ones that I made using the all-purpose gf flour mix. They were too dry, but these with coconut flour look perfect, Alisa! Love this recipe! so simple and I have all the ingredients on hand. I’ll have to find an excuse to bake them. YUM!!! I love snickerdoodles. Its just fun to say. 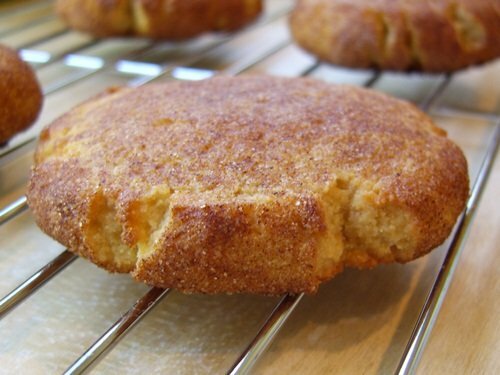 i think you’d be hard-pressed to find a cookie more universally loved than the snickerdoodle! i love that these use coconut flour. it must add such a nice flavor twist. yeah…..if you ever figure out a way to make these with an egg substitute-i’ll be all over it! I have never tried cooking with coconut flour!!! I have a great snickerdoodle recipe too, but it’s using regular flour. I will have to try your substitute and tips! 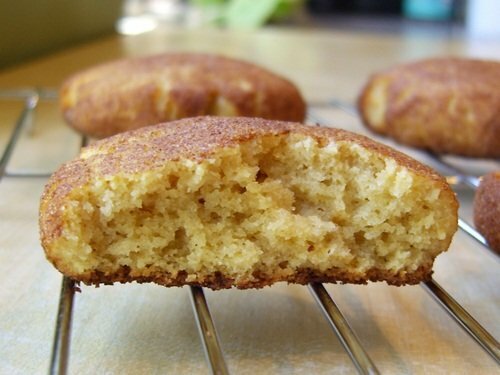 These snickerdoodles sound so healthy and totally delicious made with coconut flour and coconut oil! Excellent recipe! OMG I have to try these!!! They look awesome!!!! Made these today with my kids…AWESOME cookies! I’d like to share these on my blog…will have my readers come over to yours for the recipe. Thanks SOOOO much for a very yummy cookie!!!! It’s funny (and kind of sweet) how most of us “allergy bakers” end up trying to bake gluten free sooner or later. I think we just hate to leave anyone out when making goodies! merry xmas to you two!! I love the triple whammy coconut presence in this snickerdoodle. Yum – can’t wait to try them! I couldn’t respond on this without testing. Coconut flour is drier and higher in fat than brown rice flour and tapioca starch, so you would probably need more of each. I wouldn’t just swap one for one on this since they behave quite differently in recipes. I got 17 cookies out of this recipe. Also, I would say that if you have a toasty warm house in the winter time, you’ll want to actually refrigerate them, because the dough became warm and gooey just from being shaped in my hands. However, this dough tastes fantastic. I can’t wait to try it with coconut sugar instead of brown sugar. hi, how many cookies does this recipe make??? Yield is at the end of the recipe – it is 2 to 3 dozen. Can I use my version of this recipe on my blog? Hi Genna, not a problem, but please link back to my recipe here – http://www.godairyfree.org/recipes/gluten-free-snickerdoodles – I am migrating these recipes over to my main site, Go Dairy Free. Thanks! These look delish! Anyway you could sub the coconut oil with apple sauce? I’m on a very reduced fat diet to control MS but I still want cookies! Sorry Jana – your comment didn’t come through prior! I haven’t tested with applesauce instead of oil – it may work, but would yield very different results. At most, I would try replacing just half of the oil.